Liverpool have worked quickly to announce the signing of Fabinho from Monaco as their first signing of the summer. BBC Sport not too long ago reported that the Reds were closing in on a £39million swoop for the Brazil international, and the deal has quickly been made official. Liverpool tweeted out a video of Fabinho in the club’s new kit for the 2018/19 season, with the official site also confirming details of the move. 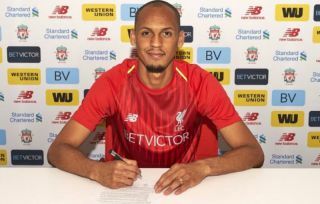 Fabinho shone in Ligue 1 and looks a fine signing, and the 24-year-old has also spoken in glowing terms about the Merseyside giants after the announcement of the deal. He said: ‘I am really excited about this move. This is something that I always wanted – this is a giant of a team. The infrastructures of the club look exceptional. ‘A football club of this size coming after my services, I didn’t have to think that much about coming over. ‘I will try to create my own history at this football club. Hopefully, on a personal level, I’m able to win titles with this club. Liverpool seem intent on strengthening their squad after losing the Champions League final just two days ago, with Fabinho a strong addition to help them challenge again next season. Fabinho himself won Ligue 1 during his time with Monaco and also helped the club to the Champions League semi-finals last season.